Let me just say that I really like this star. On the evening of May 7th UT (6th in local time) I measured T Pyx at magnitude 6.8. This was just a tenth of a magnitude brighter than a convenient magnitude 6.9 star located nearby. The next night I was expecting to find T Pyx even brighter but was surprised to find it fainter than the nearby reference star. After a break of a few days I wasn’t sure what to expect but I was pleasantly surprised to find T Pyx has brightened yet again. My observations placed it as magnitude 6.5. If all goes according to predictions based on its 1966 outburst, the nova should brighten by another few tenths of a magnitude during the next week or so. Then begins its long fade back to quiescence. 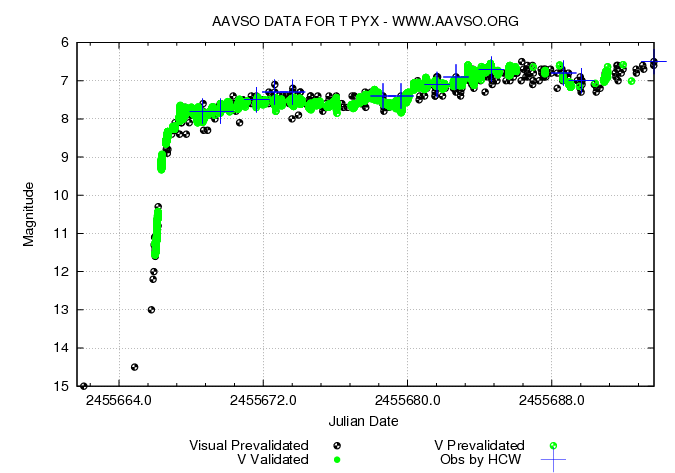 Visual and CCD magnitude measurements for T Pyx. Credit: AAVSO.